The sleepy little town in the much ignored region of North Karnataka has grown into a city and is traversing its way towards a mindless imitation of “Life in a Metro”. The concrete jungle gets bigger, the hoardings larger and the traffic at signal stops is reaching further each day. The mindless gunning of engines through the reds and the countdown at the signal junction effectively generates the grey shroud that will soon get into the habit of engulfing the city. One often wonders if there are more vehicles than people. Right in the middle of this crazy rush stands out the figure of the old trusted auto and its occupants. While the tariff woes have been elaborately reported with little being done to bring some sense to the money that one has to shell off for a bumpy ride, it’s not this issue that we seek to draw the attention too. Conspicuous amidst the traffic cacophony is the sight that inspires this piece of writing, “Packed like Sardines”. Parenting has become a demanding job for the present generation and striking the balance between responsibility and off-loading a part of it to serve the purpose of convenience is the root cause of the familiar sight of overflowing auto rickshaws. Each morning around the summoning calls of the school bell, happens this wonderful race of the “Packed like sardines” participants. It is actually really difficult to spot this trusted driver till he gets to his duty of taking the kids out of the auto and ushering them to school, all neat and trim in their well ironed and conspicuous uniforms. This age old contraption which continues to be a major means of transport has evolved with age to imitate its larger peers who carry so much load that anyone around is scared that the centre of gravity will falter into a herculean fall. 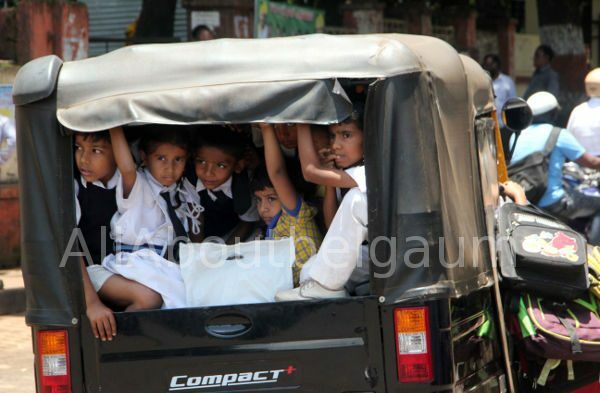 One glance at the school auto and you will see in all probability, a couple of kids on either side of the driver with half their selves almost outside the confines of the vehicle. The actual number of those packed in is rather uncertain. A variety of tiffin and school bags dangle out from their defined areas as if attempting to share the secrets of their confines with the passers-by. This ingeniously assembled arrangement makes its way through the streets, accompanied by the screams and chatter of its occupants, all eager to begin a new day at school. The excessive burden does the needful when it comes to testing the power of the helpless engine and smoke bellows from the tail pipe as the vehicle leaves a larger than needed trail of smoke as if seeking another channel to announce its arrival. “Time” is the culprit is what is proclaimed by those that speak in defence of the convenience of this arrangement. 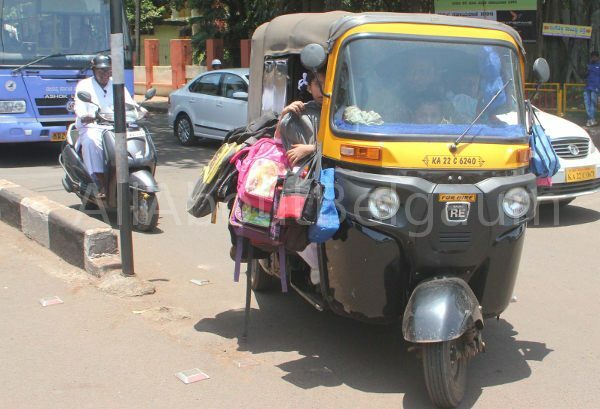 Most large schools have daintily painted and quite safe buses but there is still a large section of the population that opts for auto rickshaws as a means of transport. The school bus they say, either comes too early or is something that is not preferred by the child for a variety of reasons. One has to respect the views and needs of the overtly concerned parents since it must be some dire compulsion out of which they choose to surrender their child to this rather unsafe stunt and that too on a daily basis. Another statement that is often given in defence of the acceptance of this mode of transport is the fact that nothing has happened till date. After all, we are a country that wakes up to a disaster only when it happens for once or maybe multiple times before we really decide to opt for the sensible. After all, we did this to defy the logic of helmets and we are not going to let in so easily to common sense till we see for ourselves what might happen to at least one set of the unfortunates. Isn’t it time to put an end to this crazy indulgence in the larger and smaller interests of the community? There are those select drivers who have embraced sense and shifted to larger vehicles where everything stays indoors but what about the multitude that still chooses to opt for the cat behaviour of drinking milk with closed eyes hoping that if it happens, it will not happen to the child. With due respect to the livelihood needs and commitment of the auto drivers, one can only appeal that the alternate path of safer options finds more takes than it does today. With due respect to the lesser species of animals, how would we as parents and grown-ups feel to be exposed, knowingly and unknowingly to the dangers of being “Packed like sardines”, perchance to be slaughtered if fate decides to be more cruel that it has been before.